Itâ€™s time to ditch the morning rush of robotic, caffeine-fuelled workers, striving to fulfil the dreams of others- and put yours first. From London based Entrepreneur Jasdeep Singh, comes his first book designed to dispel the common myths and misconceptions surrounding digital marketing. More and more people are transforming their lives by using the power of the internet and building online empires directly from their living rooms. With so much information out there, it can be hard to know exactly where to start and who to listen to you. 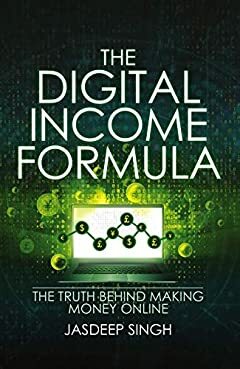 With the Digital Income Formula, you are given a very direct, easy to follow and clear guide to starting and growing your digital business. This book gives you exactly what you need to start your very own business from the comfort of your living room and create the life of your dreams. Imagine being at home, or anywhere with a WI-FI connection, with no time restraints or managerial pressures bearing down on you. Imagine watching thousands of pounds entering your bank account as you immerse yourself into the world of online marketing. Ditch your 9-5 and join the growing army of Digital Nomads by following the Digital Income Formula. Click the orange buy now button at the top right of the page and grab your copy now!